All knowledge, or at any rate all knowledge worth having, is constructed, not just found. It follows that neither the textbook, the videotape, nor even the multi-media CD or Web page, is likely to subsume completely the act of constructing knowledge in a dialogic social environment, whether face to face or electronically mediated. In the new world of educational technology, the pattern appears to be fulfilling itself yet again. The self-paced tutorials and drill-and-skill programs of the early days are yielding to web-based course designs that feature threaded discussion and collaborative work. Again, teaching as performance appears to be winning the contest over teaching as thing. This has implications beyond formal teaching and educational institutions. 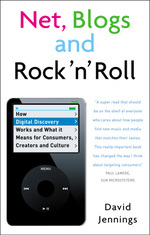 At the moment I am writing an article on the role of 'word of mouth' in how people discover new music. As word-of-mouth goes digital in online communities like MySpace.com you can see that it is being textualised in the rash of playlists spreading over the Internet. Published playlists have their place. As a means of spreading the word about new tracks and artists, they may be more efficient (less costly in effort) than making a mixtape and actually sitting in the same room as other people while they listen to it, discussing the bits you really like — but they are not as effective in getting the message across. To be sure of getting the message across performance and interaction are still the best ways to bring it to life. I agree that, as amazing and industry-changing as technologies seem to always be, the role of teacher seems to always maintain it's value. My hope is that e-learning technologies can increase the pace at which students can quickly grasp knowledge, paving the way for teachers to take students deeper. When it comes to technology and teaching it seems the more things change the more they stay the same. Technologies continue to wow us each year and yet what makes a great teacher is something quite constant ---someone who is honest, truly caring, who knows their subject, but is still interested in discovering it.